Oh my word, I have entered a 50-miler – on trail! Whenever I think of ultra trail I think of annoyingly fresh-looking vegans (why are they always vegans?) gliding over the Colorado mountains, looking very happy with themselves. I’m sure they also do CrossFit. A far cry from my huffing and puffing and screaming hysterically about snakes, cliffs and other hazards. Forget kilometres covered and pace. Measure your training by time on the trail. You cannot judge or worry about pace when your terrain is changing rapidly. Stress is an energy-sapper. Concentrate on keeping your body relaxed. Trying to run the hills will sap your energy very quickly. Practise power walking up the hills and running fast downhill. Run by feel and listen to your breathing. Huffing and puffing uncomfortably means slow down or take a walk, even if you are on a flat section. Remember that in this situation you need to be a tractor, not a Ferrari. Save your energy for the dark hours! Find yourself a comfortable hydration pack with pockets for jacket, torch, food, cellphone and other necessities. Train often with this pack, fully weighted. Gels will not get you through your 50-miler. You will feel nauseous after several hours. Find real food options that you enjoy and practise eating them on your long runs. Nuts, raisins, banana and homemade energy/protein bars are all good options. How will you replace electrolytes? Find something that works for you and train with it. The trick is to pace yourself carefully. If you run above your aerobic threshold, you run the risk of hitting a wall due to lack of glycogen. If you keep your pace constantly below aerobic threshold, your body will be burning fat and even the skinniest of us has enough fat to get through 80 kilometres. This makes the fuelling problem a lot easier. Practice this type of slow running on your weekend long runs. Keep the speed work for the shorter runs during the week. It is possible to train for a 50-miler on an average of 50 to 60 kilometres per week. The focus should be on weekend distance, preferably on trail, building to three or four trail runs of five hours each with a last long outing of eight hours before the taper begins. Last but certainly not least is strength training. You will need two to three sessions per week, concentrating on core and leg strength. Fast downhills need very strong quads and power walking up steep hills needs strong glutes. Neglect them at your own risk! 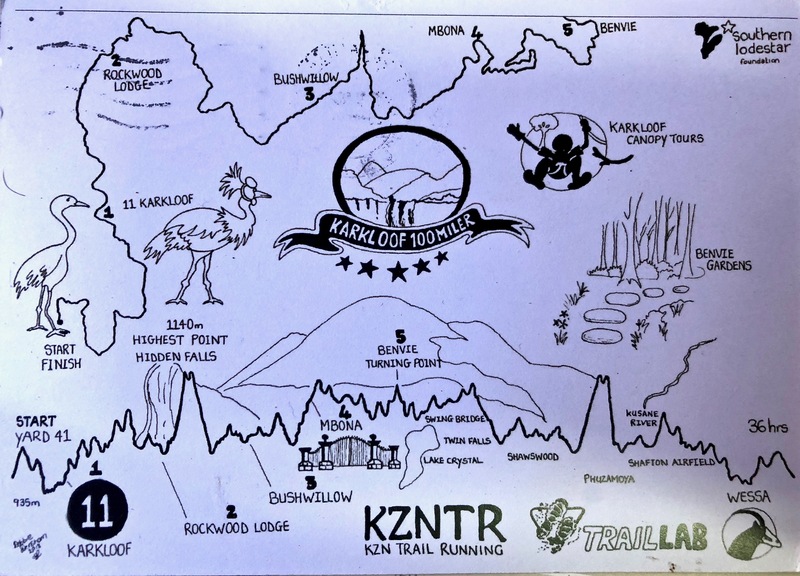 This entry was posted in running, Uncategorized and tagged 50-miler, Karkloof 100, trail on December 9, 2017 by lowlyj.